Uncle Mikes UMT-7702220, UMT-7702221 Tactical Modular Entry Vest FREE SHIPPING! The Tactical Modular Entry Vest by Uncle Mike's offers life-saving protection to civilians looking for added reassurance, law enforcement responding to a shooting call and military personnel in enemy territory. 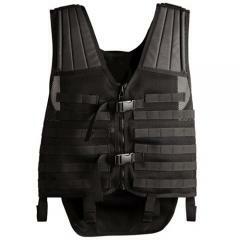 The vest is constructed of lightweight mesh and tactical nylon for a breathable and maneuverable fit. MOLLE attachments along the front and rear allow users to configure modular pockets and pouches and readjust gear as necessary. Uncle Mike's Vest is compatible with hydration packs for extended wear in the field. Note: MOLLE pouches sold separately. Browse our selection of tactical and military pouches to compliment and customize the vest according to personal needs. ©2002-2019 CopsPlus.com: Uncle Mikes UMT-7702220, UMT-7702221 Tactical Modular Entry Vest FREE SHIPPING!